American Sound Studio was a recording studio located at 827 Thomas Street in Memphis, Tennessee. More than one hundred hit songs were recorded there between its founding 1967 and its closing in 1972. The music for these hits was played by the house band “The Memphis Boys”, also known as the “827 Thomas Street Band”. Included in the many hits are “Sweet Caroline” (Neil Diamond), “Son Of A Preacher Man” (Dusty Springfield), “The Letter” (Box Tops, # 1 in August, 1967) to “Goodtime Charlie’s Got The Blues” (Danny O’Keefe), and, of course the famous Elvis Comeback session, which was two weeks in January, 1969 that produce two albums, 36 songs including “Kentucky Rain”, “In The Ghetto” and “Suspicious Minds”. 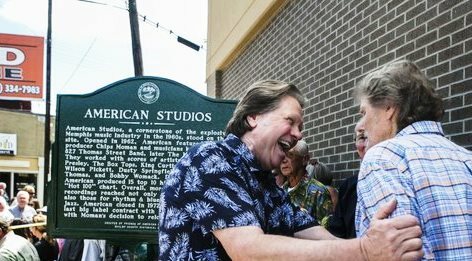 Attending the dedication were the movers and shakers of the studio, Lincoln Wayne “Chips” Moman, producer, the “Memphis Boys”: Drummer Gene Chrisman, bassist Mike Leech, guitarist Reggie Young, keyboardists Bobby Emmons and Bobby Wood and the family of the late Tommy Cogbill, bassist. Other attendees included George Klein, Mark James songwriter (Suspicious Minds), Memphis Mayor A. C. Wharton and Shelby County Historian Jimmy Ogle. 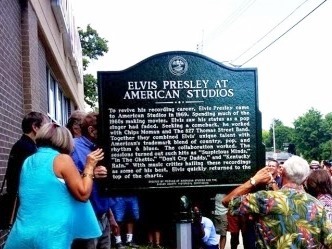 Sponsored by the Shelby County Historical Commission, the historic marker was unveiled at the former site of American Studios on Wednesday August 13, 2:00 p.m., 831 Thomas Street, in front of Family Dollar Store at the corner of Thomas St. and Chelsea Ave.